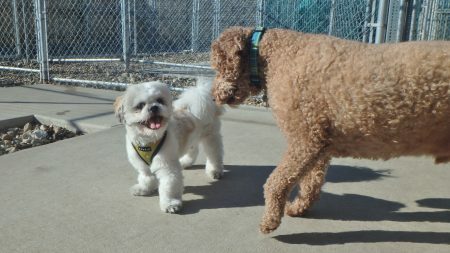 Mochi Y (Shih Tzu) is all smiles during his first day at Just Dogs PlayCare! Smiling is just one side benefit of playing with new friends like Murphy B (Mini Golden Doodle) at doggie daycare. The human dog handlers get that benefit, too! Welcome to Just Dogs, Mochi, and thanks for giving us all a reason to smile. We look forward to seeing you again!